Tom Brady of the New England Patriots sets at the line of scrimmage against the Cincinnati Bengals on Sunday at Gillette Stadium in Foxboro, Massachusetts. It was a week of fantastic finishes in the NFL. The Buffalo Bills beat the Detroit Lions on a 58-yard field goal by Dan Carpenter just moments after Lions’ kicker Alex Henery shanked his third field goal attempt of the game. The Cleveland Browns came back from a 28-3 deficit to beat the Tennessee Titans, the largest comeback in the history of the franchise. Two other games were decided in overtime. The reaction to all this from our NFL Elo ratings? Meh. Last week changed very little as Elo sees things. Elo ratings shift more when there are upsets. But last week, the pregame Elo favorites were 13-2 on the week. The Lions and Titans were the only losers. Elo ratings also shift more when scores are lopsided, so all the close finishes didn’t move the needle much. There were a couple of exceptions. The New England Patriots’ 43-17 win over the Cincinnati Bengals was the most impressive performance of the week, according to Elo, and earned the Patriots a gain of 29 Elo points. The Green Bay Packers gained 24 points after demolishing the Minnesota Vikings. And the Denver Broncos added 22 points after a big win against the Arizona Cardinals. But for the most part, the Elo standings not only look similar to a week ago, they also look much like they did at the start of the season. (Preseason rankings were based on a team’s Elo rating at the end of the 2013 season.) The top five teams in the preseason rankings were the Seattle Seahawks, the San Francisco 49ers, Denver, New England and the Carolina Panthers. Four of them remain in the top five (Carolina is the exception). The bottom five were the Jacksonville Jaguars, the Oakland Raiders, Houston, Cleveland and Washington. Four remain in the bottom five (Houston is the exception). Although the Elo ratings are a somewhat conservative system, this degree of stability in the standings is unusual. 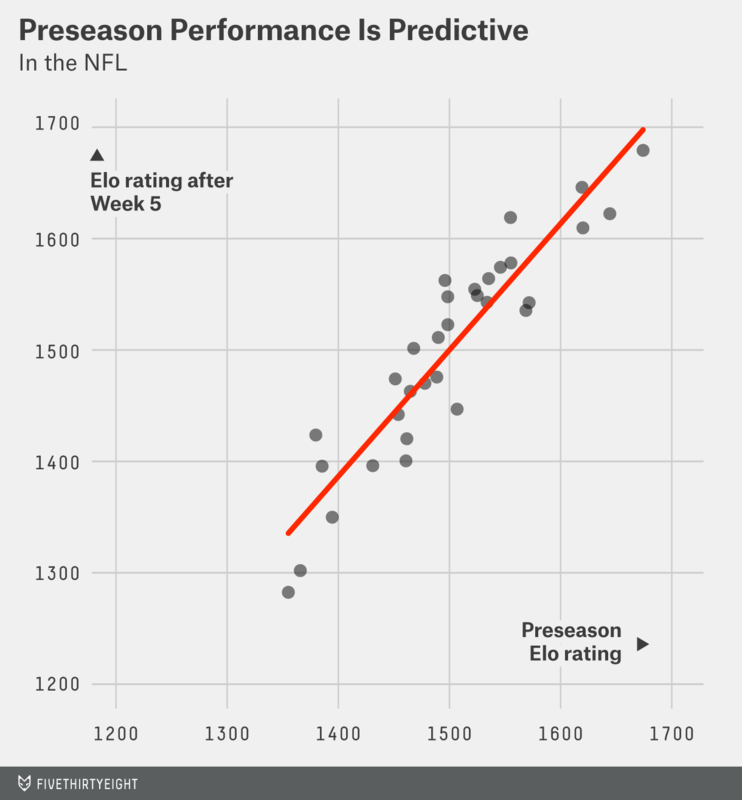 The correlation between preseason Elo ratings and the current scores is .93. My colleague Neil Paine and I have calculated Elo ratings for all NFL seasons since the AFC-NFC merger and found that this is the highest correlation on record; the typical correlation is about .8 instead. The Dallas Cowboys are the biggest Elo gainers this season, having added 67 points since the start of the year. But for the most part, this has been a season of playing up, or down, to expectations. The San Diego Chargers (+64) are the next-biggest Elo gainers after the Cowboys, and they were ranked fairly well to begin with. The teams that have lost the most Elo points are the Jacksonville Jaguars (-73) and the Oakland Raiders (-64), and they started the year as the two lowest-rated franchises. Usually, there are more drastic swings: Some team that was expected to be great gets off to a terrible start or vice versa. Since 1970, the team with the largest change in its Elo rating through the first five weeks of the season was the 1987 New York Giants (-152), who started 0-5 after winning the Super Bowl the prior year. The biggest gainers were last year’s Kansas City Chiefs (+141), who started 5-0 (and ran their record to 9-0) after having gone 2-14 in 2012. We haven’t seen anything like that this season. Green Bay saw its postseason chances improve the most. It’s a 54 percent favorite to make the playoffs, up from 38 percent last week. The Packers were helped not only by their big win against a divisional rival, but also by the Lions’ loss. The Bengals saw the biggest decline in their playoff odds, although they retain a 2-in-3 chance of making the postseason. 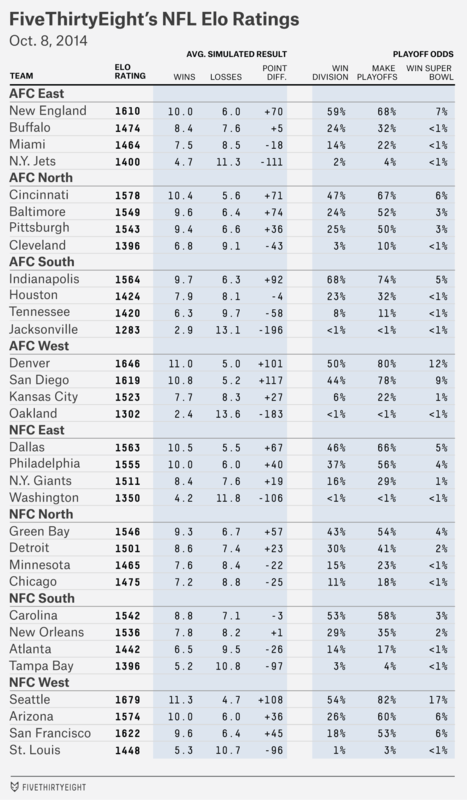 Also of note is the resurgence of the Indianapolis Colts. After the Colts started out 0-2, we noted that they weren’t in such bad shape because they play in the NFL’s worst division, the AFC South. After three wins in a row, the Colts are more likely than any other team to win their division. The Bengals’ loss eliminated the NFL’s lone undefeated team. But both the Jaguars and Raiders remain winless, and each has some chance of finishing the season with a bagel. The Raiders (who were idle last week) finished the season at 0-16 in 11 percent of our simulations. The Jaguars (who have a more forgiving schedule) did so 7 percent of the time. It’s unusual to have two such awful teams in the league at the same time. The Jaguars’ Elo rating of 1283 is the fifth-worst mark after the first five weeks of the season since 1970, while the Raiders’ 1302 rating is the 13th worst. The all-time worst Elo rating through five weeks, incidentally, belonged to last year’s Jaguars (1258). The best Elo rating through five weeks was 1745, from the 1986 Chicago Bears. Elo ratings can also be used to predict point spreads. Last week, they had a reasonably good record, going 8-5-1 against closing Las Vegas lines (not counting one game where the Elo line exactly matched the Vegas line). But they’re 33-38-3 overall on the season; we do not recommend you bet on them. The Elo ratings have had a good straight-up record so far, having called 54 of 76 winners correctly (71 percent). Elo has consistently been bullish about Chargers. Last week, it had San Diego as 10.5-point favorites at home against the New York Jets; Vegas had them favored by a touchdown instead. 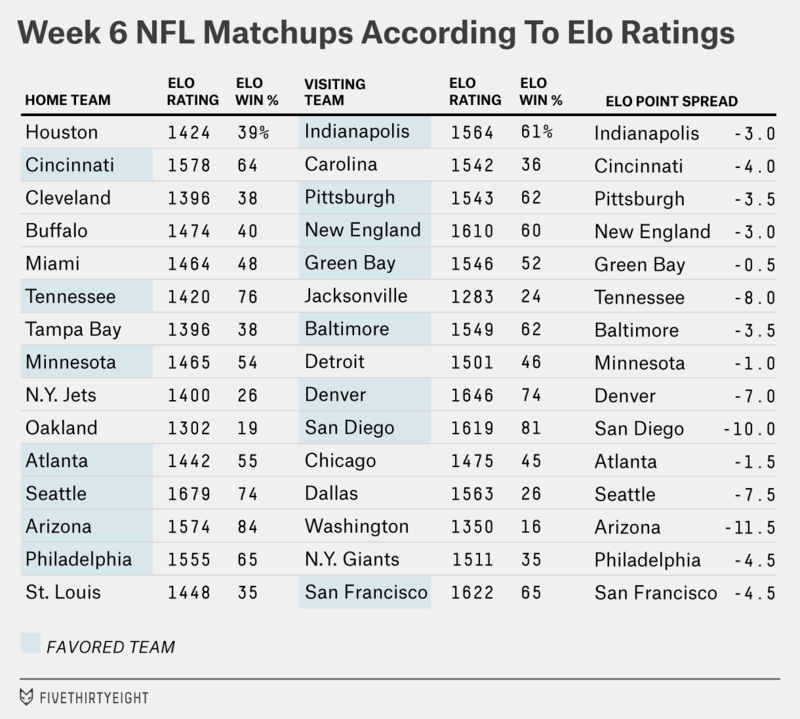 There’s a similar discrepancy this week; Elo favors the Chargers by 10 points at Oakland, while Vegas has the Chargers as seven- or eight-point favorites. But there’s a much more significant difference in the game between Arizona and Washington. The Cardinals are playing at home, and the Elo line has them as 11.5-point favorites. Vegas lines have them favored by just 3.5 points. I’m having trouble wrapping my head around why Vegas has Arizona as such a slim favorite. A 3.5-point line implies that the teams would be close to even on neutral turf. Sure, Arizona has some injuries, but Washington has been awful for the past two seasons even when at full strength.